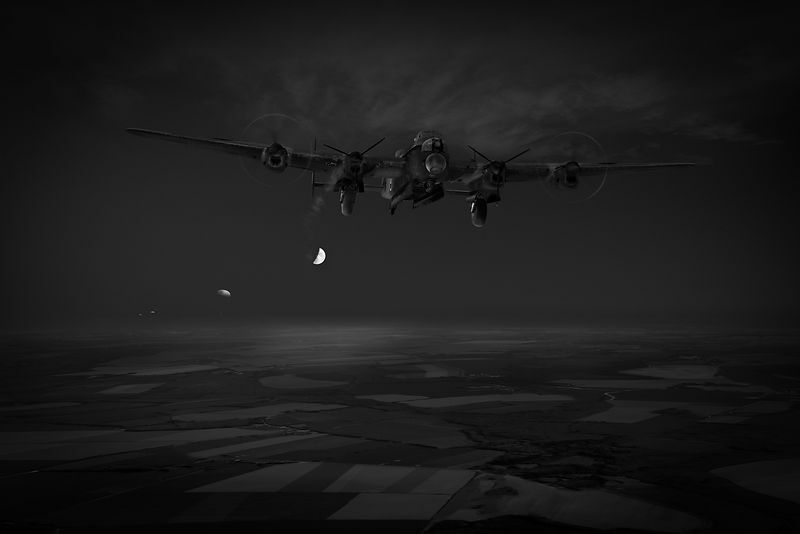 My depiction of RAAF pilot Sgt Gordon Stooke leaving his stricken Avro Lancaster, W4320 AR-D of 460 Squadron over Belgium in the early hours of 25 June 1943. The aircraft had taken part in a bombing operation over Wuppertal in Germany when it sustained "multiple direct hits from a German flak battery". The starboard inner engine was on fire for a time, flames straddling the starboard wing and No2 fuel tank, until fortunately its extinguisher worked. The port inner Merlin simply stopped. The crew headed back towards England as directly as they could. Both useless airscrews were feathered but the bomb bay doors had stuck open and the undercarriage had half lowered then jammed. With so much extra drag "D for Donald" could not maintain height on the two remaining engines. As it dropped through 2,500ft the remaining starboard engine was running dangerously hot. Reluctantly the 20-year-old skipper told his crew to bale out, then he also rolled through the forward escape hatch into the night. All the men survived and became prisoners of war - Stooke after weeks on the run, helped by members of the Belgian and French Resistance. He later wrote a book about his experiences, "Flak and Barbed Wire: In the Wake of the Wuppertal" (Australian Military History Publications, Sydney, 1997). My picture was commissioned to illustrate an extract from this that was published in the RAF Memorial Flight Official Club 2018 autumn journal.